A laid-back community of 42,000 at the base of the San Gabriel Mountains, Altadena has long been known for its beautiful setting, its variety of Mediterranean, English Tudor, and Craftsman-style architecture, and its tendency to attract an eclectic mix of residents. Today, despite being 16 miles northeast of downtown Los Angeles (making it a no-brainer L.A. day trip), Altadena still feels happily secluded. At spots like Fox’s Restaurant, a mom-and-pop diner with red gingham curtains and a sign that reads, “the flavor of onions is enhanced by adding steak,” waitresses seem to know every customer by name. Sam Merrill Trail. 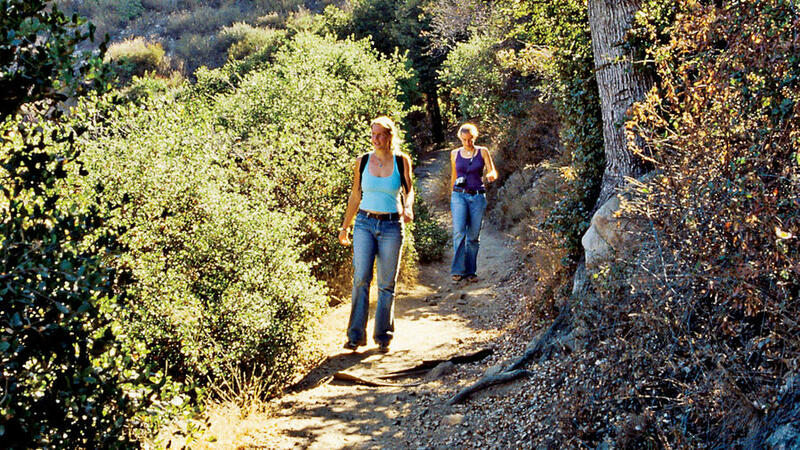 WHAT: Moderately strenuous 5-mile round-trip trail, paralleling the route of the old Mount Lowe Railroad, offering great views of the San Gabriel Mountains and the Los Angeles Basin. WHEN: Daily; early August mornings are wonderful, afternoons hot. HOW MUCH: Free. WHERE: Trailhead is just beyond a stone pillar at the north end of Lake Ave., where there’s free parking; www.fs.fed.us/r5/angeles or 626/574-1613. Fox’s Restaurant. WHAT: Good down-home food in a small-town setting. WHEN: Breakfast and lunch Tue-Sun. HOW MUCH: $. WHERE: 2352 N. Lake Ave.; 626/797-9430. Webster’s Pharmacy. WHAT: With mail service and boutique gifts, the family-owned pharmacy is Altadena’s general store. WHEN: Daily. WHERE: 2450 N. Lake Ave.; 626/797-1163. Saturday-night concerts. WHAT: Summer music series at outdoor amphitheater. When: 7 p.m. Aug 21 (Cody Bryant Show) and 7 p.m. Sep 10 (The Platters). HOW MUCH: Free. WHERE: Charles C. Farnsworth Park, N. Lake Ave. at Mt. Curve Ave.; www.altadenasheriffs.org/concerts.html or 626/296-2103. Coffee Gallery. WHAT: Cozy coffeehouse that also offers acoustic performances Fri-Sun evenings in a separate room called the Coffee Gallery Backstage; reservations recommended. WHEN: 7 a.m.-10 p.m. (visit www.coffeegallery.com for performance schedule). HOW MUCH: Show tickets from $13. WHERE: 2029 N. Lake Ave.; 626/398-7917. INFO: Altadena is 16 miles northeast of Los Angeles. Call Altadena Chamber of Commerce (626/794-3988).